Here’s a sweet blueberry smoothie recipe. I added lemon juice to brighten it up, and mango and almonds to give it a bit of body. Since we’re using high-performance blenders, I used almonds instead of almond milk. Makes ~2.5 cups: two small (but satisfying) servings or one medium-large serving. Blend on high until smooth: a little longer than usual since there are whole almonds; about 1 minute. You could of course also use yogurt, in which case you might want to skip the lemon juice. If you want to use fresh fruit, substitute ice for the water. If you can find them, I recommend trying “wild” (aka low bush) blueberries, because their flavor is often more intense than “cultivated” (aka high bush) blueberries. I’ve been buying them frozen at Trader Joe’s (along with frozen mango), although lately there’s been a shortage. I talked to a Trader Joe’s employee who said that in recent weeks they’ve only been getting limited quantities of wild blueberries, and they quickly sell out. Finally, if you’re looking for other blueberry smoothie ideas, try pairing them with cinnamon. If I add blueberries to a green smoothie and it ends up tasting “too green,” it often tastes better with some cinnamon. I made this recipe last night using fresh blueberries and frozen mango. Following the directions gave me more of a frozen custard (which did not blend well at all) so I added some Lactaid-brand milk (I’m sure yogurt would have also worked) just to thin the mixture out and get it flowing. The taste was mild, but good. I think the issue was that the ingredients were freezing due to the frozen mangoes/ice cube combo and not blending properly (even with tamping). I might just substitute milk/yogurt for the ice in future batches since I still have a large container of fresh blueberries. Thanks for commenting and sharing your experience! You raise a good point that I should have made more explicit in my directions. With the high amount of frozen ingredients, when you first blend this it will be like a thick frozen dessert. However if you keep blending it, it will soon melt and turn into more of a smoothie. 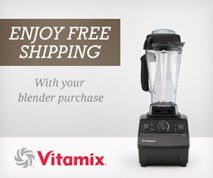 The Vitamix tamper is useful in the early stages to get the ingredients circulating. Since the recipe uses whole almonds, the extra blending time helps make the almonds extra smooth, and all of the frozen ingredients help keep it cold for that extra blending time. Adam – what I experienced was that the frozen mix was suspended above the blade (even with tamping) and was not thawing until I introduced the milk. Maybe it would have eventually thawed but I was reluctant to let the motor spin that long. How long was it running for? I think the motor should be fine to keep blending until a mixture like this melts. If it gets to be too much for the motor, you’ll probably start to smell the motor; at that point I would stop. (Unless it’s a brand new machine in which case there can be a motor smell at the beginning even without stressing the motor very much.) If you keep going the machine has a thermal protection override that will eventually switch it off before any serious damage is done. That said, there’s nothing wrong with adding some non-frozen ingredients to speed it up as you did. What a refreshing smoothie! I had fresh mango that needed to be used, so instead of 1 cup water, I used 1 cup of ice & ½ c of water. I didn’t have any issue with getting the fruit/almonds blended with the tamper. Mine came out thick, which I like. It was a little grainy from the almonds, but that doesn’t bother me. I could have blended it a little longer. I LOVE your website. Thank you for sharing all these recipes. Thank you for this recipe. I was not even thinking of finding new smoothie ideas when I ran across it. 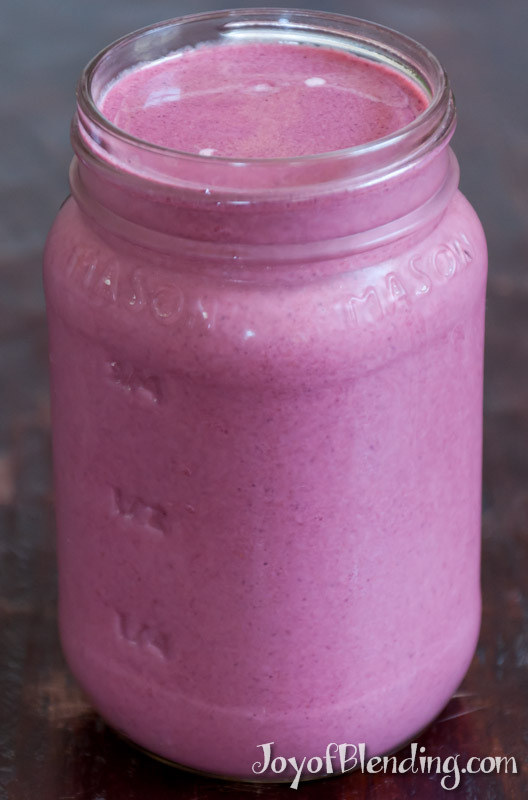 Our family drinks a smoothie about each day and your ideas will help me out of the rut I’ve been in with our Vitamix smoothies. This should work in any Vitamix container. One note though: If you’re using one of the wide containers, the tamper won’t be very effective with this smallish volume. As written, the recipe starts out pretty frozen and likely requires use of a tamper. So if using a wide container, you’ve be best off defrosting at least half of the fruit.